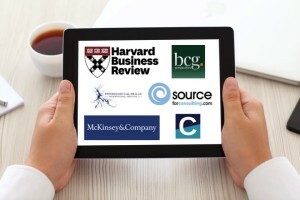 Our handpicked selection of the latest research, surveys and articles from consultants, academics and professional services firms around the web and a summary of our thoughts. To read the original article, simply follow the link through to the author’s website. We are always interested to know what you think about these articles so please do contact us or leave a question or comment below, particularly if you would like to direct us towards a recent article we could feature. Sostrin outlines that when individuals seek to improve their skills and abilities at work, their learning and development initiatives need to consider both the challenges of the “job-within-the-job” as well as how they will add value to the organization. This is defined as the hidden curriculum of work. The hidden curriculum should take into account the visible, clear, and understood challenges of work, as well as the concealed, ambiguous, and undefined challenges. In reality, the hidden curriculum for a manager would include: an ability to interpret and prioritise department’s goals, have the ability to communicate among different stakeholders, along with the emotional intelligence to manage different political and cultural dynamics, an ability to build rapport and establish trust, to delegate, mentor and coach and to make difficult decisions in the interest of the firm. Many of these tasks will involve learning, practising and refining new skills and abilities not immediately obvious in the job description. Hence, the hidden curriculum of work. The ‘hidden curriculum’ notion has significant implications on those responsible for learning and development initiatives. Rather than simply outlining a list of ‘core competencies’ necessary for a job role, L&D leaders have a responsibility to define the hidden aspects of the role and make sure that these abilities and skills are learned, practised and developed. The original article ‘The Hidden Curriculum of Work’ by Jesse Sostrin can be found here. A new review has been published which could have implications on the role of eLearning in the workplace. The review of brain training games in “Psychological Science in the Public Interest” has found that, unfortunately, when people spend time completing mental exercises on their phone or computer, they will most likely only become better at those exercises or very similar tasks and probably won’t see consequent improvements in performance at work. Overall, the new research has found that brain training rarely leads to real-world benefits, beyond gains in the training exercises themselves. The reason is because the mental exercises involved in brain training games are “decontextualised”. As we have often said to our clients, when it comes to learning and development initiatives: Context is King. You can access the original article on the British Psychological Society website here. This excellent (short) blog article by Seth Godin neatly summarises the difference between skills and talents. Knowing the difference has great implications for those working in professional services and particularly those responsible for learning and development strategy. The article is particularly relevant for those who believe that certain skills (such as emotional intelligence) are actually innate talents that cannot be learned, practised or refined, when in reality, the opposite is true. “If you can learn it, it’s a skill. This excellent and thought-provoking article in the Harvard Business Review argues discussions about organisational culture should move from simply symbols, values, emotions and behaviours to encompass customer expectations and company identity and importantly, provides a framework to achieve such an objective. – In Level One, culture is seen through symbols, rituals, stories, and other organization events. – In Level Two, culture is reflected in how people think, behave, and feel in the organisation. Culture shows up in the values, norms, unwritten rules, emotional responses to, or flows of ‘how things are done’ in the company. – Level Three defines culture as the identity of a company as perceived by its best customers, representing an outside-in view of culture. A winning culture (Level Three) therefore ensures that employees behave, feel, and think consistently with promises made to customers and other key stakeholders. Step 1 – Define the right culture: “What is the shortlist of what we want to be known for by our best customers?” Focus on external promises and identity. Step 2 – Translate the ideal customer-centered identity into behaviours for employees: Actions, thoughts and behaviours that ensure the company’s brand is reinforced in the perceptions of customers and shareholders. Step 3 – Design the right processes, practices, and structures for supporting and encouraging those behaviours: Management and organization processes, practices, and structures create that sustain the right behaviours, such as staffing, training, promotions, measurement, rewards, organization structure, work design, information management, physical arrangements, and leadership development. With regards to leadership strategy, to truly adopt an ‘outside-in approach’ requires choosing, developing, and promoting leaders at all levels who reflect your desired culture. Within the firm, it becomes clear that leaders’ behaviours represent customers’ expectations. You can access the full Harvard Business Review article here. To find out how PSfPS can help your firm adopt an ‘outside-in’ culture, with the requisite processes, practices, skills, behaviours, leadership/partner development and training programmes, we would be delighted to speak with you. 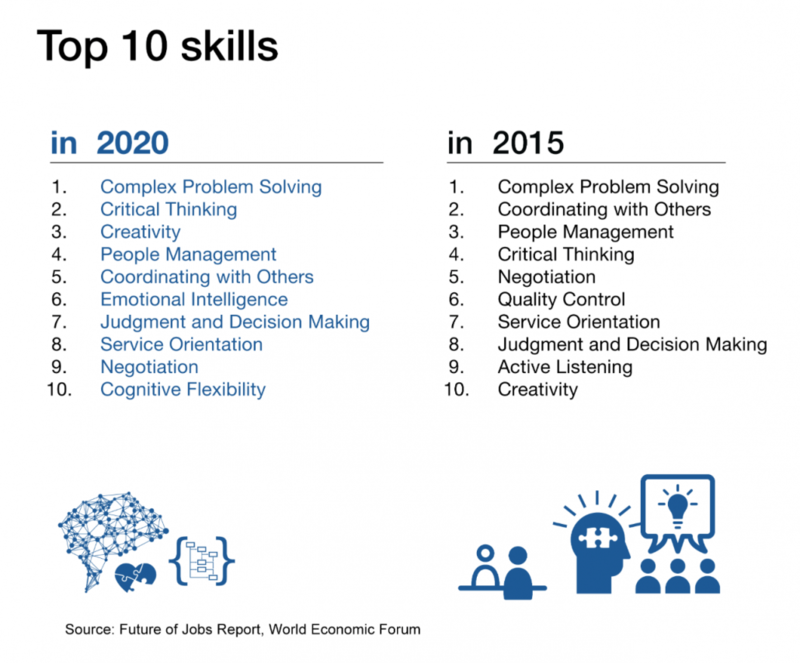 The World Economic Forum recently published their ‘Future of Jobs’ report looking at the employment, skills and workforce strategy that will be required in the future, based on the views of chief human resources and strategy officers from leading global employers. The report argues that by 2020, the Fourth Industrial Revolution will have brought us advanced robotics and autonomous transport, artificial intelligence, machine learning, advanced materials, biotechnology and genomics. As a result, over one-third of skills (35%) that are considered important in today’s workforce will have changed. PSfPS’ professional development programmes are ideally placed to help your employees learn, practice and refine these core behavioural, cognitive and analytical skills. If you would like to find out more about how PSfPS can develop these core skills and behaviours for your workforce, we would be delighted to speak with you. Carl Sagan describes how ‘Critical Thinking’ means thinking like a scientist – applying a healthy skepticism that shields against clueless guile and deliberate manipulation of the data when presenting a point of view, conclusions or recommendations. Sagan argues that scientists, when undertaking critical thinking, are equipped with a “baloney detection kit” — a set of cognitive tools and techniques that fortify the mind against penetration by falsehoods. 3. Arguments from authority carry little weight. 4. Spin more than one hypothesis. 5. Try not to get overly attached to a hypothesis just because it’s yours. 7. If there’s a chain of argument, every link in the chain must work (including the premise). 9. Always ask whether the hypothesis can be, at least in principle, falsified. Sagan goes on to argue that the ‘Baloney-Detection Kit’ should also help us to unlearn and avoid the most common pitfalls of common sense that damage critical thinking and subsequent points of view, conclusions and recommendations. Critical thinking is a key skill in professional services and provides the foundation for many core business activities including but not limited to: consulting processes, business development, problem solving, innovation, client relationship management and strategy formulation. Adopting a structured analytical thinking process enables professional services organisations to develop a point of view, formulate a strategy, identify opportunities, find a competitive differentiation, form conclusions and provide recommendations supported by rigorous thinking and undeniable logic. Critical thinking is perhaps a particularly relevant skill today with the rise of and prevalence of ‘Big Data’ and a requirement to analyse large amounts of data to form practical and relevant conclusions and recommendations. For this reason, critical thinking (using a structured, hypothesis-based analytical thinking process) is a key skill PSfPS develop within our clients’ organisations. Professional services organisations must ensure that the next time they apply an analytical thinking process they adopt Carl Sagan’s “Baloney Detection Kit”. This should ensure arguments and recommendations have been critically evaluated before being presented to clients or decision makers. The full article by Maria Popova “The Baloney Detection Kit: Carl Sagan’s Rules for Bull***t-Busting and Critical Thinking” from the excellent and thought-provoking ‘Brain Pickings‘ blog can be found here. If you would like to find out how PSfPS can help you professional services organisation to learn, develop, practice, refine and then apply critical thinking through a structured ‘Analytical Thinking Process‘, we’d be delighted to speak to you. This article by Harvey Deutschendorf neatly summarises recent research by eminent organisations and individuals who share the same conclusion that people with high levels of emotional intelligence (EI) are often more successful than those with low levels of EI. Research quoted comes from: the Center for Creative Leadership (CCL), Egon Zehnder International, The Carnegie Institute of Technology and Nobel Prize winning Israeli-American psychologist Daniel Kahneman. The article also discusses Carnegie Institute of Technology’s finding that 85% of Financial Success was a result of “human engineering”, personality, and ability to communicate, negotiate, and lead and only 15% was due to technical ability. These fundamental ‘Human’ skills and behaviours form the foundations of our professional development programmes. Core business operations, whether business development, consulting, negotiation, presenting, leadership, relationship building, marketing, networking, change management, proposal writing, meeting management, brand development, R&D, innovation and engagement management (to name a few!) are all founded on learning, developing, refining and practising these core ‘human’ skills and behaviours. We call these ‘Human’ skills and behaviours because they are acquired through human experiences, interaction, explanation, modelling, collaboration, coaching, feedback and mentoring. If you’d like to know more about how we develop these skills and behaviours for our clients, we’d be delighted to speak to you. The full article at Fastcompany.com can be found here. This thought-provoking article in the Sloan Management Review discusses how, in contrast to previous generations, more and more employees are searching for a higher ‘sense of purpose’ at work. The article also provides examples of how some companies are already embracing this shift in expectations and values among their workforce. The old job negotiation formula used to be ‘Salary, benefits and bonus’. This has now been replaced with salary, benefits, bonus and being. Employees are shifting towards demanding what Maslow called “self-actualisation’ at work. Staff members want to be able to express their ‘whole being’ at work – physically, intellectually, emotionally and even spiritually. The article states nicely that the days of leaving your ‘values’ at home when you step through the threshold of the work elevator are long gone. This shift in the mindset of employees will both pose challenges and provide opportunities for the way companies engage with their workforce. Those companies who get this engagement right will have a highly motivated and productive team. Those who do not embrace this change in employee mindset will have disengaged workers who will likely be looking elsewhere for an employer who allows them to ‘be themselves’ and provides them with a ‘sense of purpose’ for their work. Furthermore, this shift in employee expectations will have particular relevance with the rise of the Millennial generation (Generation Y) in the workplace and their distinct set of attitudes towards work. This annual survey of business executives, managers and analytics professionals from across the globe by MIT Sloan backs up what we have been advocating for a long time regarding the role of analytical thinking in business. Our view, backed up by this research, is that due to the abundance of data available to organisations today and the ever-competitive global environment, those firms who have a plan (or ‘Talent Plan’ in this survey) to develop the analytical thinking skills of their employees will continue to derive the greatest benefit, both for themselves and their clients. Developing ‘Internal Capabilities’ is also a key aim for firms, with half of the survey respondents (50%) stating that turning analytical insights into business actions is one of their top analytics challenges. In accordance with this survey by MIT Sloan and as a result of the importance of this behaviour in business today, ‘Analytical Thinking‘ remains one of the most popular programmes within our Core Professional Services Skills curriculum. If you have any questions about our Analytical Thinking programme, please do not hesitate to contact us and we will be pleased to help. To read the full findings of the survey “The Talent Dividend: Analytics talent is driving competitive advantage at data-oriented companies” please follow this link. Storytelling is a key professional behaviour that we very much advocate in business and it has its own programme within our Core Professional Services Skills curriculum. Bernadette Jiwa is a key advocate of using storytelling in business and writes a very good blog called: “The Story of Telling” which focuses on how brands can become meaningful and add real value if they tell a story that clients can believe in. Storytelling is about gaining a true understanding of the mindset of your clients and potential clients – that is, knowing who your clients really are and knowing what they really want and care about. Storytelling is also about communicating in an effective and instinctive way that conveys information but also stimulates emotion and a feeling of connection. Telling a story will help your firm to differentiate your brand, help you generate ideas and deliver a service that people can and want to believe in. What’s more, stories are memorable, so this behaviour will ensure that your brand, and all that it represents, remains in the forefront of your clients’ minds. In a recent blog post, Bernadette writes about the “10 Ways To Avoid Getting A One Star Review.” There are some really good points in the article and we encourage you to read it in full. The key point for professional services firms to note is that everything you do when you interact with your clients, and prospective clients, tells your story and reflects on your brand. These interactions, also known as ‘touchpoints’ or ‘moments of truth’, can be from the way you answer the phone, to the quality of your marketing materials, to the way you undertake business development meetings or deliver your final recommendations. A particularly nice idea in the article is for firms to write their own ‘five star review’ that they would hope to receive and then share this with their team. Every touchpoint within your business should then be designed to live up to this expectation. You can access the full “10 Ways To Avoid Getting A One Star Review” article here. You can find out more about our Storytelling programme here. If you would like to discuss our ‘Storytelling’ programme, please do not hesitate to contact us. INSEAD recently published a blog by Filip Hron, Negotiation Consultant, Lecturer and Author (INSEAD MBA) called ‘Stop Selling!‘ The article suggests that firms have to stop selling and trying to satisfy their own interests (usually more money!) and instead focus on helping customers to make the best decision for us, in our best interests. You are encouraged to read the full blog here. The article also runs through the awkward sales conversations that have become the norm in some environments, when a salesperson continues to offer you exactly what you are not looking for, nor asked for. Hron outlines that, fundamentally, if we believe that the salesperson is not acting in our best interest, we do not trust them and if instant distrust when we meet a salesperson is the status quo, this is not a sign of things working well. We wholeheartedly agree with the article that you do not sell when building a relationship with prospective clients. I am confident that our clients will agree that they have never been ‘sold to’. Instead, the key is to start helping and create a case for why your prospective clients should buy from you. You need to invest in the fledgling relationship and constantly look for ways to contribute positively. Establishing trust is paramount. It is also true that when buying complex services, particularly professional services, buyers can be nervous, sceptical and suspicious. In order to overcome these issues you must understand the mind of the buyer, know what motivates them and be prepared to manage the critical conversations in a completely different manner to the examples in the article. Do not pre-judge what your prospective buyers want but instead engage and listen. Many of the issues discussed above and in the ‘Stop Selling!’ article are expanded upon in our ‘Building Your Business’ programme (which forms part of the Business Development Behaviours Curriculum). Please do not hesitate to contact us if you have any questions or comments or would like to find out more about our curriculum. You can find the full ‘Stop Selling!’ article here. We hope you find it interesting and thought provoking. The paper starts by outlining how teams perform better when they exhibit a few key processes, including: agreeing minimum working standards, keeping tabs on progress, and having extra help available when necessary. The key finding of the study is that once you took into account the team’s stand-out helper, there was no value in looking at the helpfulness of the other members; you can already guess how constructive the team as a whole will likely be. These exceptional individuals have been termed “extra-milers,” and when these “extra-milers” put in significant efforts, the team performs much better. The research also suggests that when you have an ‘extra-miler’, you must ensure that they are able to interact regularly with the rest of the team to spread their positive way of doing things and model these superior norms of behaviour. It is easy to see how this research could have implications for both team strategies within organisations but also how those in positions of authority must be able to demonstrate key leadership behaviours amongst their teams. The British Psychological Society Research Digest blog can be found here and the original Journal of Applied Psychology article can be accessed here. Have I thought through this situation? Do I need outside input to make progress? Does moving forward require a real-time conversation? Does this necessitate a face-to-face meeting? Read the full article at Harvard Business Review here. It is now more important than ever for businesses to change, innovate and rethink their strategies completely as a result of accelerating technology, economic volatility and globalisation. However, this change is particularly challenging, if not impossible, without changing the culture mind-set that underpins the organisation and this can only happen if leaders and executives truly engage in this process. The article by AlixPartners takes a closer look at the role of structure, systems, management practices and talent and poses questions that leaders must consider when trying to implement cultural change within their firms. Read the full article here. This article argues that success in business depends on your ability to bridge psychological distance. This concept is defined as social distance (gaps between yourself and other people), temporal distance (gaps between the present and the future), spatial distance (the distance between where you are and faraway places) and experiential distance (the difference between imagining something and actually experiencing it). It is really easy to get bogged down when trying to segment the consulting industry. Fiona Czerniawska at Source for Consulting has developed this simple, Disney-style castle model to explain the current dynamics of the market. This excellent analogy describes how clients see the strategy consulting industry and cleverly outlines the competitive forces at play within the consulting industry. A really good read.